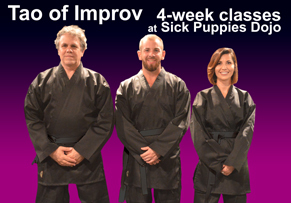 Some improvisers find musical improv easier to do than other improvisers. Some improvisers will never be able to do musical improv. Time’s up. The first statement is true. The second is a lie. Unfortunately, many improvisers believe both of them. Musical improv is a term that encompasses many skillsets. Most of them are extremely teachable within an improv setting. You can learn the techniques that will help you perform most — if not all — of these skills. You can become a welcome addition to a musical improv team. In fact, by learning these skills in a methodical way and seeing how they fit into an improv scene, piece or game, you may become better at musical improv than the person who has a great voice, lyrical skills but no training in how to apply them to improv. Sometimes, beautiful choices are more valuable than beautiful voices. There are ways to instill a sense of rhyme that, over time, becomes more and more a part of you. Not that rhyming is the be-all and end-all of musical improv. It isn’t. And there are ways to learn what each part of a song (verse, chorus, bridge, etc.) is for, and how to simplify the use of each of them. I also developed a fun game that can get you singing emotional, powerful duets in absolutely no time (in which you learn that lyrics are often secondary to emotion…just like in regular improv!). I’ve seen it. I’ve taught it. I’ve been taught it. There shouldn’t be a fear factor associated with musical improv. It’s a discipline, like any other. Follow simple rules to start with, work out a few muscles that need it most, and you can do this. Maybe you’ve done some bad karaoke (a redundant phrase, in my opinion) and think that musical improv will be like that, minus the alcohol and the inattentive crowd. It’s not. It’s fun. You can learn it. And the least likely people of all (supposedly) have quickly become excellent practitioners. You can most certainly be one of them. If you’re ready, and there’s a chance to do musical improv where you are, sing out!